EH has been inundated with requests to reissue this classic. We're very happy to report that a modern version has been completely designed and we now have them in stock! LIMITED PRODUCTION RUN. So book your orders now before they're gone. 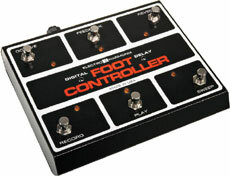 The 16 Second Digital Delay's optional Foot Controller allows you to "foot" switch six different functions remotely. You can instantly turn up the Sweep, Reverse, and Feedback on or off, and shift the Loop up or down one octave. With identical record and play FSWs from the main unit, the Foot Controller plugs directly into the footswitch jack with a standard guitar cable. It's kind of hard for me to write an extremely detailed review at this time because I've only owned the 16 Second for about 2 weeks. I''m still learning all the ins and outs. One thing i can say is that it's an extremely clean and clear looper and has a nice fat sound to it. It's also a very fun pedal to play with. The modulation (which can be swept in and out) on this pedal is pristine and literally sounds like your adding it in "post-production" on a $5,000 console! All in this tiny box! I have not explored the Midi capabilities of it yet, nor have I tried a controller with it, but for me that's not necessary at this point. I must say that this is one of the best quality and sounding pedals that I've ever owned. The 4 beat count-in does not bother me at all...I actually prefer it. There are pretty much unlimited timing and recording possibilities with the 16 second. It's a piece that will never leave my arsenal.